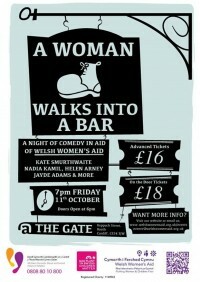 Welsh Women’s Aid are holding a comedy night ‘A Woman Walks in to a Bar’ on Friday 11th October 2013 from 7 pm at the Gate Arts centre in Cardiff. The night is an opportunity to have some fun and a few laughs while fundraising for this very important cause. The comedy fundraiser features comedians including Kate Smurthwaite, Helen Arney, Nadia Kamil and Joe Wells, which promises a night of fun and feminist banter. WWA is the national umbrella organisation representing local Women’s Aid Groups situated throughout Wales. Their member groups provide direct services for women and children who have experienced or are experiencing domestic abuse.